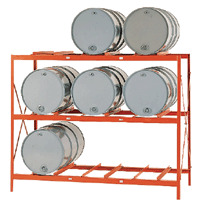 Meco Omaha Drum Storage Racks are constructed of heavy duty steel angle for storing 30 and 55 gallon steel drums. 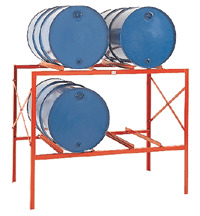 Load and unload drums from front or rear. Assembly is easy - simply bolt four vertical legs to individual levels, attach X-bracing to ends and rack is ready to accept drums. For maximum flexibility units may be ordered to permit back to back installation allowing a user to customize every system to his own requirement. 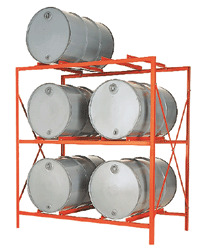 By combining units, any degree of capacity in nearly any type of space can be obtained. All units are 34" deep. 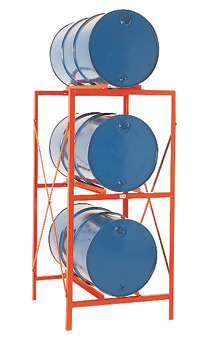 Capacity 800 lbs/drum.